Brother Jonathan, a pre-cursor to Uncle Sam, has given John Bull a bloody nose. Behind them in the background two ships are firing at one another. John Bull is acknowledging his defeat, while Brother Jonathan is mocking him, saying that although John Bull may have "thought yourself a Boxer," the Americans are an "Enterprizeing Nation, and ready to meet you with equal force any day." As stated by the handwritten note at the top of the image, this cartoon refers to the capture of the British brig Boxer by the American Enterprise in September of 1813. Like many other cartoons during the War of 1812, this image is meant to celebrate the successes of the American military, particularly the Navy, and improve morale. 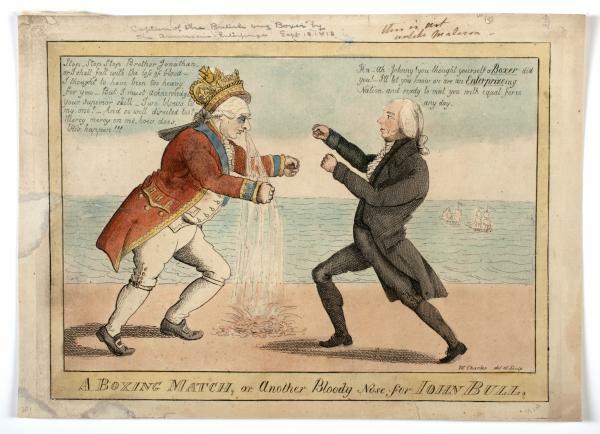 John Bull (left): Stop, Stop Stop Brother Johnathan, or I shall fall with the loss of blood - I thought to have been too heavy for you - But I must acknowledge your superior skill - Two blows to my one! - And so well directed too! Mercy mercy on me, how does this happen!!! Brother Jonathan (right): Ha - Ah Johnny! you thought yourself a Boxer did you! - I'll let you know we are an Enterprizeing Nation, and ready to meet you with equal force any day. Author/Creator: W. Charles del et sculp.